Glass processing is particularly demanding on linear motion components with its abrasive environment and high production rates. Glass edge grinding is a common process where the sharp edges of cut raw glass are finished for safe handling and to reduce chipping defects that can lead to breakages. The most important and economical glass edge finish is seaming or arrissing, where the sharp edges of glass are chamfered on all 4 edges, top and bottom. This process is important to contain stress, like a frame, within the glass area while it is heated to over 800°C and then chilled, to create Tempered Safety Glass. Without this process, the glass would simply explode into hundreds of tiny pieces during the chilling stage. When seaming experts Ashton Industrial designed their new fully automatic seaming line, SEAMMAXX-PRO, the objective was to simplify and reduce the cost. A further objective was to develop a clever system of using vacuum on moving transport belts to hold each glass firmly from the underside during seaming without any contact to the upper glass surface which can carry a delicate, coated heat reflecting film. SEAMMAXX-PRO is arguably the fastest seaming line in the world; producing cut to size lites (glass sheets) in 8 -12 seconds depending on size. Fully automatic, the lites are in totally random mixed sequences and sizes can range from 150mm x 300mm to a huge 6m x 2.8m. The machine is a very compact vertical system. To accommodate the vacuum belt arrangement and keep the glass processing level clear of obstructions, the four grinding heads are mounted on tracks below the production line rather than from a gantry system over the top of the line. There are two pairs of seaming heads, each with one fixed head and the other moving automatically in and out to seek and find the parallel glass edge. This allows two edges to be ground at the same time, which in turn reduces the machine size envelope and cycle times. As the heads have a mass of over 500kg, and are moving at up to 60 metres/min, heavy duty linear guides are an absolute necessity. For this core role, a pair of HepcoMotion’s HDS2 heavy duty linear guides are utilised on each pair of heads. One guide in each pair is rack and pinion driven to drive the moving seaming head back and forth. 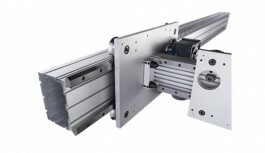 HepcoMotion is a world-leading manufacturer of linear motion systems and the HDS2 is its ultimate heavy duty solution with a wide range of V bearings and linear guides to handle the heaviest loads. Says Richard Green, Senior Manager – Business Development, Ashton Industrial; “Having worked with HepcoMotion for many years, we knew their solution would provide the required precision and be able to cope in such an aggressive and abrasive environment. These SEAMMAXX-PRO lines often run 24/7 and downtime outside of planned maintenance is critical. We always found the technical support from HepcoMotion valuable and this was particularly useful when specifying for this new machine with its alternative solution”. As they are below the production line in a wet environment, the HDS2 guides are coated with thin dense chrome (TDC) – a corrosion resistant coating. Stainless steel bearings are also used for this reason. The pinion is made from high grade case hardened steel for maximum wear resistance, making them a good option for working in a contaminated environment. Working with water and glass dust residue can be challenging for any linear equipment, as the two can result in an abrasive mix. Hepco’s V guide system effectively addresses the problem of debris entering the sliding mechanisms thanks to its self-cleaning action. V guide functions on the basis of tight geometrical control over matching guide and bearing V’s. In turn this provides a wiping action that expels debris, keeping machines running and reliable. This self-cleaning action eliminates contamination of the guide. Having invented the V guide system nearly 50 years ago, Hepco is well renowned for its V guide technology and the many benefits it offers. One key benefit with V technology is that only a small amount of lubrication is required to prevent wear of the guide, and in some instances it can also run dry. This was important for Ashton to avoid glass dust and debris sticking to the grease on the guide. Cap seals with felt wipers are used which provide effective sealing and protection, plus wiping of debris from the guide profile. The heavy duty seaming heads are mounted to the HDS2 guides on a low level framework parallel to the ground, so compliance is a key requirement. The guides need to perform on an un-machined surface and so must be tolerant of a degree of misalignment. The design of Hepco’s V bearing allows for the bearing to perform on uneven surfaces and cope with variances in the mounting surfaces. Similarly, the V bearing is highly tolerant of misalignment when setting up 2 x rail systems in parallel. Parallelism of +/- 0.05mm allows Ashton to reduce the set up time needed to accurately assemble the system. In this application, blind hole V bearings are used as access to the back of the fixing plate is not possible. As the seaming heads are moved backwards and forwards at high speed up to 6 times a minute to adjust to random widths of glass, a smooth and repeatable movement is paramount. HDS2 provides a low friction and highly accurate system ideally suited to providing smooth indexing. This was particularly important in this application as successful seaming at industrial level is based on speed, process reliability and precision. Ashton produce the SEAMMAXX-PRO lines in different sizes and layouts according to the needs of each customer. The machine is made to accommodate the biggest sheet of glass being processed – for some customers this is 2 metres, for others it can be up to 6 metres. Hepco’s HDS2 guides provide a good solution thanks to their availability in modular lengths. The HDS2 guides are accurately machined and ended to make up butted sets – which allows Ashton to accommodate different sizes. Designed for the professional glass processor, SEAMMAXX-PRO is in daily use right across the globe, typically operating in triple shifts. With such high duty cycles and an aggressive environment, only the toughest systems, such as these from HepcoMotion will survive.